Felicity tells Doug that she likes to do business with "friends". The scene skips to later that night at the Willis house. 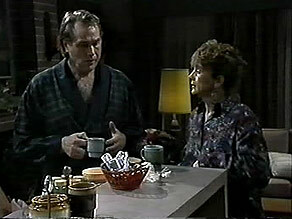 Doug is restless and gets up for a cup of tea. Pam comes in from her meeting and Doug tells her that he had a "quite promising" meeting with Felicity. Pam is quite suspicious and Doug reluctantly says he has something to tell her. DOUG: Pam, you know I love you. And you know it's important that I get the Brent job. DOUG: Felicity wanted me to do more than just renovate the house. DOUG: She's a very persistent woman, Pam. DOUG:(breaks into a laugh) You should have seen your face! He laughs while Pam hits him with a cushion. Joe has made a nice green cot for the baby and is showing it to Kerry and Matt. Matt, Kerry and Joe are off to the movies - Kerry is trying to cheer Matt up over Gemma. Matt moans on about Madge's ban. He is determined to find a way around it. Then he starts going on about how much Gemma is like Kerry herself - knows what she wants, independent and very beautiful. Gemma has written yet another note to Matt that she wants Ryan to deliver. He invites Gemma to go cycling on the weekend, but Madge overhears and is suspicious. Ryan heads off, telling Gemma that Matt is going out to the movies tonight, but he doesn't know who with. 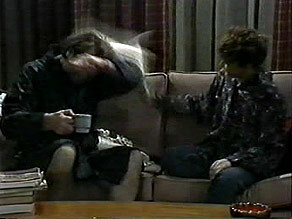 Kerry is going out to see Beverly while Matt is rushing round getting ready for school. Ryan comes over with the letter from Gemma which he gives to Matt. Matt grills Ryan about Gemma, but he is reluctant to give details. Instead, he puts the thought in Matt's mind that Gemma might get tired of waiting for him. Matt decides to write Gemma another Ryan-mail letter. Ryan rolls his eyes. Beverly has told Kerry about her plans to go to live in Perth, and apologises that she won't be there for the birth of Kerry's baby. Beverly is heading off tomorrow. KERRY: I'm really sorry about you two. BEVERLY: Well, I think we've both accepted it's for the best. Beverly gives Kerry some of her baby things now that she won't need them anymore. Beverly tries not to cry as Kerry thanks her. Joe sees Des on the road - he's come to see Beverly. He wants to know what his chances of staying in the flat are, now that Beverly is selling the surgery. Joe tells him about the potential job he and Doug might get with Felicity. 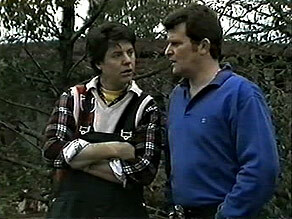 Des warns Joe to be careful - Felicity is a man-eater. 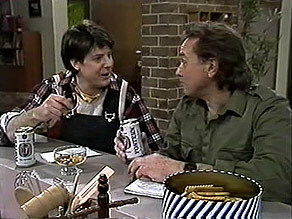 Joe scoffs, but Des explains that Felicity has been all over Doug lately. Joe comes in and the Willises immediately ask him to play basketball - they're having a fundraiser for the exchange program. Doug and Joe talk about the Felicity job - they haven't got the job yet, but Doug thinks it's looking good. He thinks having Joe on board to do the landscaping will give their bid the edge. Pam warns Doug to watch his step with Felicity. Gemma and Ryan see Matt sitting at a table with a strange girl. Ryan explains that her name is Debbie Norton and then mentions that she recently split up with her boyfriend(!) Gemma looks a bit worried. Just then Matt looks up and calls Gemma over. But Harold her and hustles her away, saying that Madge is inside. Gemma sits at the bar and sulks while Pam, Madge, Jim and Des talk about Pam's fundraising plans. Madge suggests that Harold and Eddie could join the basketball team. Harold isn't keen, but offers to referee instead. Jim and Des put their names down for the team. Joe and Doug are going through the finer points of the Felicity Brent job. The phone rings and Doug answers it to Felicity. She tells him that they've got the job and they can start immediately! Joe and Doug are still discussing the job when Pam comes in. She tells them that the basketball game organisation is coming along well. Doug tells her that they got the Felicity Brent job and Pam is delighted. DOUG: I had to explain to Joe how I had to go beyond the call of duty. PAM: Oh, that's all right, then. But in future, could you have your client conferences away from home? It's a bad influence on the kids. Joe lurks in the background looking appalled! DOUG: It's a small price to pay. JOE: Are you two fair dinkum?! PAM: You don't get anything for nothing these days, Joe. JOE: You're a pretty progressive couple! DOUG: We understand each other. JOE: Doesn't that put a strain on your...relationship? DOUG:(trying not to laugh) It's all a matter of financial survival, Joe. Gemma and Ryan are studying, but Gemma is distracted. She's thinking about Matt and Ryan starts winding her up about Matt and Debbie Norton. Ryan invites Gemma to go to the movies with her after the cycling outing - just as friends. Gemma says she'd better not - she's Matt's girlfriend. But Ryan talks her round - after all, Matt has been seeing another girl friend. Just then, Kerry comes in reading the mail. There's a letter from Eric - Sky's father. He doesn't say whether he will allow Joe to adopt Sky, instead, he's going to come and visit. Joe isn't too pleased to hear this. Gemma has finished her study, and gives Ryan another letter for Matt - she wants him to come and meet her. Ryan is horrified and tries to talk her out of it. He refuses to deliver the note, saying it's not fair on him. Finally he agrees, but says it's the last time he's delivering any notes. Beverly arrives just as Ryan is heading off. When Ryan is outside the door, he reads the note, and then tears it up!